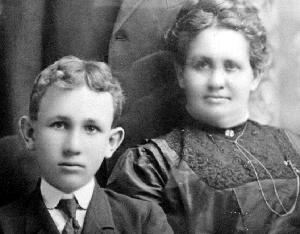 Ida was only 19 as she rode a lumber wagon from Riverside. Just a year before she had come there from Illinois with her husband and two-year-old son. Now in 1887 they were moving on to the promise of a new townsite. Main, Sixth and the Grand circle were being plowed for grading. The mesa was brown and bare without a house in sight. In the middle was an office of the land company with the only well for drinking water. Water for washing and bathing had to be hauled from the Santa Ana River. On a lot on Sheridan between Ninth and Tenth, the three of them spent nights sleeping under boards leaned against their wagon while building their house. When finished off at just 12 by 14 feet, it lacked most conveniences, including a floor. The coyotes were held at bay, Ida even shot one herself, and one morning when the bedding was taken up, they found a rattlesnake that had been sharing their meager comforts. The railroad was coming and Ida survived by baking bread for the crews. Between 1888-1889, a grasshopper invasion ravaged the lemon groves and Ida helped sew cheesecloth covers for the young trees. When the Hotel Temescal was built, she got a job as a cook. After several lonely years, she fell in love with and wed William Henry Frazier. Their son, Ray, was the first child born in the newly incorporated City of Corona. Compiled from archives in the Corona Library Heritage Room, Mrs. Ida B. Frazier�s incredible life is punctuated by one reference after another of her pioneering efforts. Delving into the details, one discovers faraway facts over distances of time where only written memories remain. Ida had been known for her courage, intelligence and hard work. So much so, that when Corona�s only hotel, the Temescal burnt down, the city fathers asked her if she would be willing to operate a new one. The city advanced her the money and Ida Frazier was registered as the property owner in the tax accessment records. She drew the plans for the hotel and it was built just in time to board the arriving telephone crews. It was in this hotel that Corona�s first telephone was installed. 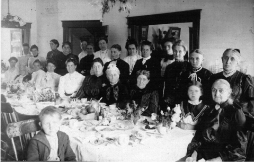 The first of many Chamber banquets were held there and it continued to serve for countless seasons of social events. In the midst of the blossoming town, Ida�s years of poverty were replaced with prosperity. She was soon able to repay the loan to the city and continued a life of service to the community. The hotel stood for decades as a congenial centerpiece in a gentler age, it�s history evolving with the times. Somehow passed up by unraveled redevelopments, the hotel remained active until disassembly in 1998. An important objective of Corona Heritage Park is to represent �a sense of place� that was once Corona. That �place,� that belonging, that profound feeling of substance, is the progeny of the past century. The hotel that Ida built embodies one of few remaining connections. The building�s useful function as a hotel had simply ended, but its usefulness has not. In its soon-to-be reconstructed edifice of pleasant architecture is an irreplaceable historical value. March 15, 2004, marked the Hotel Del Rey's 100th Anniversary Celebration at Corona Heritage Park and the ceremonial groundbreaking for its restoration campaign.